Finally something that I can can lend my expertise about...I am a dentist. I have to admit however that both the Oral-B and Sonicare brushes do a fantastic job and will eliminate many times more plaque than a manual toothbrush. I also have both models, but only because the sales reps give them to me. The key with any electric toothbrush is two things: 1) to not impart any additional brushing action while using it (read: don't scrub your teeth with electric toothbrushes). You run the risk of damaging the gums and causing gum recession and wearing notches into the teeth, both of which can result in sensitivity. Instead of additional action, gently move the brush from tooth to tooth and on all surfaces you can reach. 2) Brush placement is key. You can brush your teeth for an hour but if your brush isn't contacting the areas where the plaque rests it will not be removed by brushing. Sounds simple but I would have to say that over 75% of the people I see everyday feel like they spend adequate time brushing, but most miss quite a bit of plaque down along the gumline. Bottom line, both models work beautifully, and both get the job done in comfort and style... For anyone who might be curious, I personally use the Sonicare almost all the time. (04-13-2015, 05:41 PM)merkur man Wrote: Finally something that I can can lend my expertise about...I am a dentist. I have to admit however that both the Oral-B and Sonicare brushes do a fantastic job and will eliminate many times more plaque than a manual toothbrush. I also have both models, but only because the sales reps give them to me. The key with any electric toothbrush is two things: 1) to not impart any additional brushing action while using it (read: don't scrub your teeth with electric toothbrushes). You run the risk of damaging the gums and causing gum recession and wearing notches into the teeth, both of which can result in sensitivity. Instead of additional action, gently move the brush from tooth to tooth and on all surfaces you can reach. 2) Brush placement is key. You can brush your teeth for an hour but if your brush isn't contacting the areas where the plaque rests it will not be removed by brushing. Sounds simple but I would have to say that over 75% of the people I see everyday feel like they spend adequate time brushing, but most miss quite a bit of plaque down along the gumline. 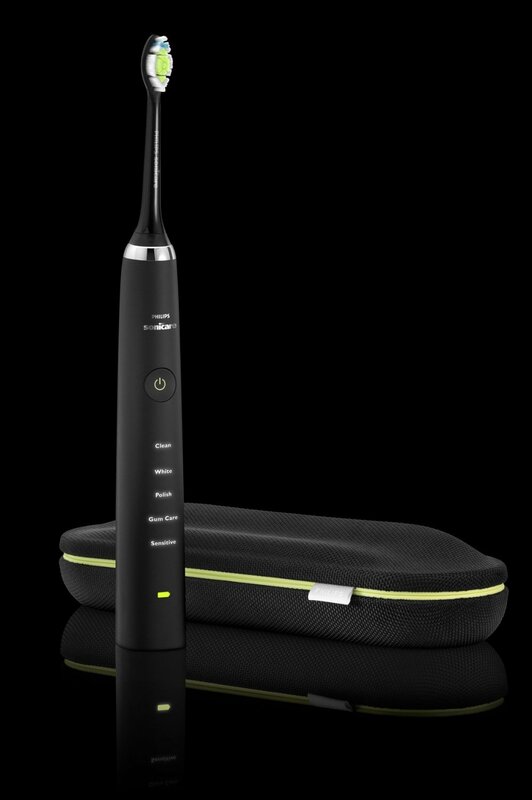 Bottom line, both models work beautifully, and both get the job done in comfort and style... For anyone who might be curious, I personally use the Sonicare almost all the time. I'm still testing both out. Went for both top models in black version. The Philips look almost elegant. The Braun less so, yet still looks great. The feel in hand goes to the Philip as well. But Braun is not that far off. The sensation and cleaning of the gums/teeth I feel both do excellent. I prefer the Braun for teeth cleaning, but prefer the Philips for gum massage and plaque removal. Will visit my dentist in 2 weeks time and hear her thoughts. Was there last time 7 weeks ago. If Darth Vader has teeth to brush under his helmet I am confident he'd choose to use this brush! (04-14-2015, 05:43 PM)merkur man Wrote: If Darth Vader has teeth to brush under his helmet I am confident he'd choose to use this brush! That's the one I own. Looks elegant. Feels great in my hand. Great tool to clean the gums. It's definitely a really nice looking brush. But more importantly, as you mention Claus, they are very effective at removing plaque. I have the white version. As an aside, do you find that with the black color it starts looking dirty quickly? I have always wondered if it was like a black car in that respect. Obviously I am confident that you wash it off well after each use but just wondered if it shows any grime. One of my favorite things about this Sonicare model is the methods of charging. Both the cup and the travel case are innovative and convenient charging methods. It does look stained faster than the white, but the surface is very smooth so cleaning it is fast and easy. I also own the black Braun Oral B Pro 7000, and it has more edges and is a bit more cumbersome to clean, but it's more black and white, than all black, so not that big of an issue to clean either. I have used both and prefer the Oral-B for a couple of reasons. The Sonicare has an annoying tickling feeling, though I did get used to it after a few uses. The bigger problem for me is that the Sonicare throws toothpaste all over the place while brushing. I have now been using the Oral-B for years and my dental hygienist keeps telling me that whatever I'm doing to maintain my teeth (brushing, flossing, etc.) to continue doing it because my teeth and gums remain healthy. That works for me. (05-17-2015, 02:08 PM)freddy Wrote: I have used both and prefer the Oral-B for a couple of reasons. The Sonicare has an annoying tickling feeling, though I did get used to it after a few uses. The bigger problem for me is that the Sonicare throws toothpaste all over the place while brushing. I have now been using the Oral-B for years and my dental hygienist keeps telling me that whatever I'm doing to maintain my teeth (brushing, flossing, etc.) to continue doing it because my teeth and gums remain healthy. That works for me. Either of these brushes will remove many times more plaque than a manual toothbrush, and therefore your hygienist will be pleased because you'll have less gingival inflammation. Congratulations on the great dental checkups, it is gratifying to get control of your oral health! The solution for a reduction in the toothpaste residue on the walls is simply to close your mouth my friend! I've used the Oral B for years. Works very well as long as you use it for the full time on the internal timer. My dentist noticed an immediate difference after I started using it. They asked me if I had my teeth cleaned in between visits to them. I'm on my second or third oral-b. My teeth just feel cleaner than with a manual. I tend to have extended times between cleanings, my hygienist grumbles a bit and told me to close my mouth more when brushing my upper wisdom tooth. I had baaaaad experiences with dentists as a kid, and it still bothers me. When I was a kid I recall not getting numb until riding home in the car.My current dentist and I have figure out that it takes lots of novacane and extra time for me to get numb, especially on the bottom jaw. (05-20-2015, 03:49 PM)tinashubby Wrote: I'm on my second or third oral-b. My teeth just feel cleaner than with a manual. That's because they actually are cleaner! I tell all of my patients that if they'd like to have that just cleaned feeling to use an electric toothbrush. They remove many times more plaque and bacteria than manual toothbrushes. I have been enjoying the Philips Sonicare, also. It is really keeping my teeth clean! Have now used both the Sonicare and Oral B daily, and think I will continue using one in the morning and the other in the evening. I've been using the Philips Sonicare FlexCare Plus for the last 2.5 years. However, the brush is starting to show a lot of wear and tear. The battery life isn't great and half of the indicator lights no longer work. They have a 2 year warranty and mine started acting up right after the 2 year mark. So I'm not thrilled with the brush. At about $160, that's not a great value on a yearly basis. However, this brush taught me that all the extra features and brushing modes are useless for me--just give me the standard brushing mode! Based on the positive reviews of the Oral B brushes, I might buy one of them once my current Sonicare finally dies. (06-02-2015, 03:53 PM)vadim Wrote: I've been using the Philips Sonicare FlexCare Plus for the last 2.5 years. However, the brush is starting to show a lot of wear and tear. The battery life isn't great and half of the indicator lights no longer work. They have a 2 year warranty and mine started acting up right after the 2 year mark. So I'm not thrilled with the brush. At about $160, that's not a great value on a yearly basis. However, this brush taught me that all the extra features and brushing modes are useless for me--just give me the standard brushing mode! Based on the positive reviews of the Oral B brushes, I might buy one of them once my current Sonicare finally dies. I'm testing both of the top models from Philips and Braun, and if I experience a thing like you did, I will for sure go for a cheaper model without all the xtra kind of useless features. This is why I went with the basic model. The "extra features" are in reality a sales gimmick. The only mode on Sonicare brushes that really does anything different than the others is the "gum care" mode. And the only reason it indies anything different than the others is because it goes for 3 minutes instead of 2. The thing that really does make a difference is which brush head you select. Sonicare has many different brush heads, I am partial to the Diamond Clean heads in particular the Diamond Clean Intercare. I tell my patients to try the different brush heads on the basic model as opposed to purchasing the models with all of the supposed bells and whistles. Saves money and you can sort out which head you prefer. 2.5 years does stink. In my office I'd say we occasionally have people come in and complain about their Sonicare brushes going bad on them. But the vast majority of people get a far better lifespan. I have a Sonicare flexcare that I received about 7 years ago sitting in one of my treatment rooms that just about every patient I see each day plays around with and drops on the floor. It's still going strong. Sounds like you got a dud.